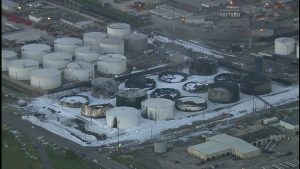 On Sunday, March 17, 2019 at approximately 10AM, a storage tank caught fire at the Intercontinental Terminals Company (ITC) Deer Park facility, located at 1943 Independence Parkway. Industry neighbors and multiple local agencies actively fought the fire to prevent it from spreading and to extinguish it as quickly as possible. Early this morning, certain air quality readings were found to be above our very conservative air quality standards. The cities of Deer Park and Galena Park issued shelter-in-place orders. At this time, air quality readings that we are monitoring are at lower levels, and the city of Deer Park has lifted its shelter-in-place order. Galena Park’s shelter-in-place order is still in effect. ERC Teams were called into action early Thursday morning to assist clients with assessing indoor air quality (IAQ) in facilities within the shelter-in-place borders. ERC’s long background with assessing IAQ gives clients confidence that we can help them manage this critical situation. What are we testing for? Benzene and Toluene. Both of these chemicals were released into the air after the fire was extinguished and clients are looking to make sure their workers/students are safe to return to work/school. About Benzene: It is a colorless, flammable liquid with a sweet odor. It evaporates quickly when exposed to air. Benzene is formed from natural processes, such as volcanoes and forest fires, but most exposure to benzene results from human activities. It is among the 20 most widely used chemicals in the United States. The Department of Health and Human Services has determined that benzene is a known carcinogen (can cause cancer). Both the International Agency for Cancer Research and the EPA have determined that benzene is carcinogenic to humans. Exposure to benzene may be harmful to the reproductive organs. About Toluene: It is an aromatic hydrocarbon. It is a colorless, water-insoluble liquid with the smell associated with paint thinners. It is a mono-substituted benzene derivative, consisting of a CH3 group attached to a phenyl group. The effects of toluene on animals are similar to those seen in humans. The main effect of toluene is on the brain and nervous system, but animals exposed to moderate or high levels of toluene also show harmful effects in their liver, kidneys, and lungs and impaired immune function. Do not touch any substance, residue, or particles from the plume (smoke). Wash your hands and exposed skin with soap and water thoroughly for 3-5 minutes if you have come in contact with residue/particles. Bathe your pet while, wearing gloves, if they have come in contact with reside/particles from the fire. Move your pet indoors to reduce contact with any substance, residue, or particles from the plume. Contact your healthcare provider if you feel you or a loved one are experiencing any related symptoms. Check on elderly neighbors or those who you are concerned about.